Climate change is a real threat. Ice caps melting. Sea levels rising. Some scientists have predicted that coffee may eventually no longer exist as a result of global warming. Coffee. No kidding. We’ll give you a moment to collect yourself. Caffeine addictions aside, there are serious consequences to rising global temperatures, and we need to get a handle on things sooner rather than later. And no, a sorority chapter president won’t be able to do much about disappearing coastlines or increasingly brutal hurricane seasons, but there are other ways she can utilize her leadership skills. Even with average global temperatures on the rise, winter can still be pretty darned cold. Michael Bublé singing “the weather outside is frightful” may be a cutesy little lyric if you live in Florida or the sunny California coast. But let’s say you’re a student in Minneapolis or Grand Forks, North Dakota. Suddenly “Let It Snow” sounds like some kind of sadistic joke, a crime against humanity. Your fur-lined boots may be super cute, but they’re still soaked through from last winter! While everything around you turns to ice and sisters head home for winter break, your chapter’s momentum is in danger of freezing over, too. As sorority president, what do you do? First, put down the blowtorch. This isn’t one of those movies. The day after final exams, sisters will flee your chapter house for early flights, food and fun. They’ll leave it a little emptier, a little colder. Chapter momentum will take a long pause. Or will it? OmegaFi wants to help you keep things on track until the spring semester’s flowers bloom once again. 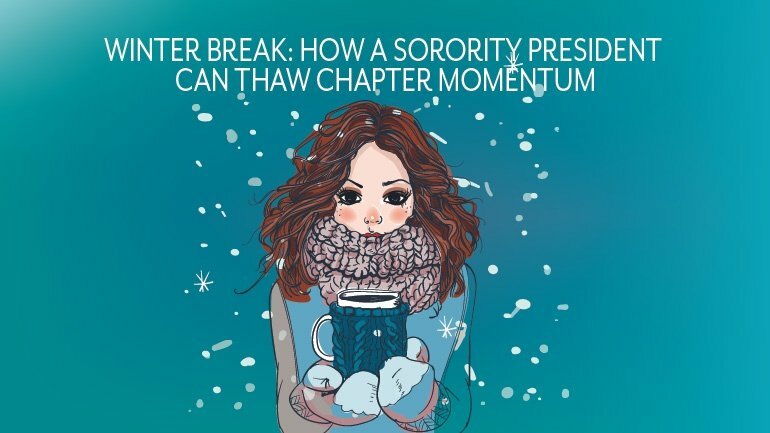 Here’s How a Sorority President Can Thaw Chapter Momentum. It may be “Ice, Ice Baby” outside, but that doesn’t mean your chapter and every one of its goals goes cold until next semester. Communication is the bedrock of your sorority chapter, and it can help get you through December ready to take on sorority life with renewed vigor. As sorority president, you can facilitate communication that will keep sisters, alumnae, chapter advisors and university officials connected and ready to hit the ground running. Of course, you’ll spend a lot of time on mom’s couch and won’t want to work all December long. But think of it this way. You’re already on Facebook and Instagram all day, posting selfies with your cousins and holiday meal recipes. Why not KIT with sisters with that same vigor? We’re not talking about having virtual executive board meetings that go on for hours, but some light touches can go a long way. Use sorority communication software like GINSystem to bat around final ideas for chapter activities. Hopefully you’ve done the bulk of the prep work last fall, so these should just be stress-free tweaks here and there. Send alumnae a virtual holiday card. And if there are any questions or concerns about the chapter property during break, be quick to respond whenever possible. One mistake would be to drop off the grid during winter break. While you deserve a rest, you should be relatively available to touch base on important spring plans. That said, minimize this by doing most of your planning prior to the break, and don’t be a doormat. Keep these conversations brief and to the point. Like we said, you aren’t going to cram your break full of exec meetings and hammer out chapter initiatives. You want to step off campus with the chapter’s spring plans basically set. Lay the groundwork for the spring, but go into winter break with a specific agenda of small goals you can tackle. Focus these goals in one or two particular areas or projects. Also, plan ahead of time to work on these goals with officers, committee members and sisters. It’s unfair to rope sisters who’ll be out of the country or otherwise super busy with mandatory work. Say you need to finalize the rush for spring. The schedule of events, costs, food and all the major details are set. So ask sisters to come back from break with fun ideas about decorations, or ask them to think about one thing they want to take away from recruitment when they talk to potential new members. These aren’t difficult or time-consuming tasks. Sure, sisters might forget about it the second they’re out of the house. But if you’re communicating with them throughout the break, you can touch base about any ideas they have, and then organize these ideas when you come back next January. Don’t worry if sisters aren’t one hundred percent up to speed when the spring semester begins. They’re jet lagged, they’re still in chill mode, and it’s going to take a minute to get back into the swing of classes and sorority life. If you’ve planned properly and coordinated with housing and other officials, you should be back in go mode relatively quickly and smoothly. Instead of going full drill instructor, start out by checking in with everyone, sharing holiday stories, pictures and videos. Since the bustle of sorority recruitment, term papers, lab reports and quizzes is about to hit your chapter pretty hard, take the time to celebrate the fun times. Showcase sisters’ winter break photos on the chapter Facebook or webpage, or produce a slideshow with the best ones to show in the common area. Chill, catch up, and share a laugh and a hot cocoa knowing that when the spring sun rises above the thawing grass, your chapter will be ready to seize the day. When finals week ends, sisters put their pencils down, and the chapter house closes its doors, what do you do to keep the momentum going? How do you plan before the break, and how do you get into the swing of things after? Let’s talk sorority winter wonderlands in the comments below.